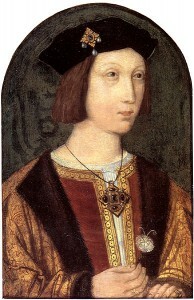 It was April 2nd 1502 when Arthur Tudor, age 15, died. To honor Arthur’s short life, masses were said, ceremonies were held and a lavish funeral took place. It was April 25th 1502 when he was finally laid to rest at Worcester Cathedral. The general consensus was that Arthur’s death was caused by the plague or sweating sickness. In recent years, many historians believe that Arthur’s death could have been caused by tuberculosis, testicular cancer, or diabetes (amongst other things). It is interesting to note, that Arthur began to feel ill shortly after his marriage to Catherine of Aragon, in early November 1501. What’s even more interesting is that an outbreak of a mysterious virus had swept through Shropshire just when Arthur and his bride Catherine had taken up residence at Ludlow Castle…. Whatever the cause, to the people of England, Arthur’s death seemed to be a sign of bad things to come. This was the opposite reaction they had to his birth, on September 20th 1486. Back then, Arthur –who Henry VII named after the famous warrior, King Arthur– was seen as a beacon of hope, prosperity and political stability to the common people, to the kingdom and to his father. As such, Henry made sure that his son was well-groomed to one day succeed him…. Arthur was given prestigious titles such as the Duke of Cornwall. A few years later, he became the Prince of Wales and the Earl of Chester. Henry also made him a Knight of the Garter. Arthur was given Ludlow Castle as his residence along with a retinue of servants and councilors. He was expertly tutored by men such as politician John Rede and poet Bernard Andre. Arthur was also well-trained in warfare and diplomacy. With such an upbringing, the young Prince certainly left behind what would have been a most promising future. He also left behind him the hopes and dreams of a father…. A father –a King– who wept tears of sorrow when he heard that his son had died. It was his wife, and mother of Prince Arthur, Queen Elizabeth of York, whom Henry VII summoned to his bed chamber to share in his despair. But Henry was so overcome with emotion that the Queen had to cradle and comfort him. She reminded him that God had blessed him greatly, that they still had a son and two daughters, and that they were young enough to have more children. But no sooner had Elizabeth left Henry’s side did she succumb to overwhelming grief: her husband having to comfort her…. It wasn’t long before Elizabeth became pregnant with, what is thought to have been, her seventh child. It was at the Tower of London on February 2nd 1503 that she gave birth to a girl; called Katherine. But the infant died just eight days later. Henry VII’s bad luck continued when Elizabeth became ill from a postpartum infection. Unlike today, postpartum infections were vastly misunderstood and not well treated; so much so that it claimed the lives of many women during the Tudor period. It was this that Elizabeth died from on February 11th 1503: her 37th birthday. When it came time for her funeral, the normally tight-fisted King Henry, spared little expense on the service; spending a grand total of £3,000. Elizabeth was then laid to rest at the Lady Chapel (aka Henry VII Chapel) in Westminster Abbey on February 23rd 1503. The loss of his wife was a devastating blow to Henry on many levels. Not only had he lost the woman who had helped solidify his claim to the throne, but he lost someone whom he had deeply cared for. Henry and Elizabeth were not always so close. Their marriage had been an arranged one: set up by their mothers, Margaret Beaufort and Elizabeth Woodville, and later encouraged by Henry’s council. And what started out as a loveless political union based on uniting the Yorkist’s and the Lancastrians, later blossomed into one of genuine affection and a sort of quiet, dignified love. The successful nature of their marriage was in part due to Elizabeth’s good, dutiful and generous nature. A great beauty, she was reportedly tall, with fair skin and hair, and blue eyes. But with the passing of his wife, Henry became a shell of his former self. He grew weary in spirit and more focused, determined and paranoid as ever. In the years following the death of his wife, Henry did make several attempts to remarry. His decision to consider another marriage had mainly to do with strengthening England politically and financially. That he would be filling the void Elizabeth left in his life is debatable, but quite likely. Among his potential wives was Catherine of Aragon: Arthur’s widow, but the marriage to her father in law never came to be; she became betrothed to his surviving son: the future King Henry VIII, instead. Margaret, Archduchess of Austria, was another potential wife but she declined the offer. Henry VII also tried to wed Joanna of Naples but no satisfactory deal was ever reached. 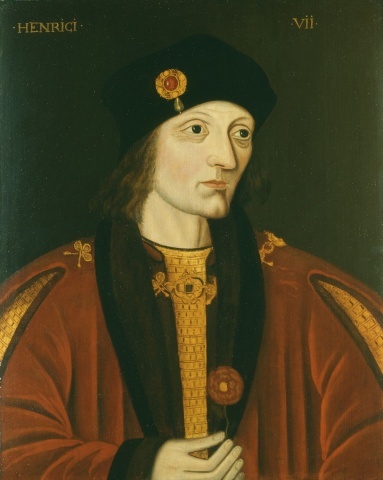 In the end, Henry VII spent the rest of his years unmarried. He also had to be content with his youngest son Henry inheriting the throne. It was in and after 1507 that Henry VII’s physical health and emotional state began to decline. He took his bed at Richmond palace, where he made his confessions and received his rights. Henry VII succumbed to his afflictions and what is ultimately thought to have been tuberculous on the night of April 21st 1509. Henry was 52 years old; having reigned as King of England for 24 years. It is said that his ill-health, dejected demeanor, and death was in part due to the loss of his wife. Henry was buried in early May 1509, beside his wife, at the Henry VII Chapel, at Westminster Abbey in a vault. Years later, Henry VIII had the Italian artist Torrigiano create an ornate tomb effigy that depicted his parents…. As King, Henry kept most of his vulnerabilities and emotions in check. But we can see that following the death of his beloved son Arthur and wife Elizabeth that Henry was a man who grieved and showed grief and who loved and showed loved. It seems that he genuinely cared for them, not just for what they meant to the Tudor dynasty, but as people too. As Vergil noted, Henry was, on many occasions, known to be gracious, kind, deeply religious, and diplomatic. Henry was not always the frail and shriveled looking man portrayed in some of his paintings and his death mask, either. He was once reasonably attractive, charming, tall and well-built. His later appearance was due to ill-health, the duties of kingship, a turbulent life, and personal tragedies. Unfortunately, Henry’s reputation is that of a shrewd, cold, calculating and paranoid man who cared more about money and power than anything else. His bad reputation is warranted in many ways, but it’s also not a completely fair or entirely accurate estimation of his character either. If Henry VII hadn’t defeated Richard III at the Battle of Bosworth Field in 1485, and therefore wasn’t seen as a usurper, I think perhaps people would view him as a human being who had both good and bad qualities. And whose decisions, deeds and demeanor were the normal and justifiable actions of that of a natural-born King. I’m Karlie (also known as History Gal on Twitter)! I’m a pre-med student from the U.S. I have many interests including reading, writing, drawing and painting but my passion is History. I have read and love to read just about every period in history but I am most interested in the Tudor period. I’m intrigued, not just by the Tudor dynasty, but also by the world in which they lived: the people, the religion, the politics, the conflicts, the events, the castles, the beautiful clothes, just overall their way of life. It should go without saying that I love England and its rich history. My dream is to go there and see as many Tudor related places as I can! Excellent article and beautifully written. Thank you. I attended Queen Elizabeth’s School in Wimborne Minster, Dorset. This was named in honour of Elizabeth of York who established a school on the site. It was nice to learn more about her. Thank you; it is always great to have more insight into this time. I think this article speaks more of the unsaid. “Henry made several attempts to remarry.” No one wanted to marry the King of England. His reputation was evident even at that time. A louse. There may be some truth to that but there were several potential brides who were already in negotiations to marry him. But some didn’t materialize due to political and financial reasons. Add also to the fact that his health was already increasingly ill. This article has helped me to soften somewhat toward Henry VII. After reading so much about Richard III and becoming so sympathetic to him and kind of a “Ricardian” I found it hard to feel any good for a person I regarded as a usurper to the crown. I wanted to change history at Bosworth. And then to add insult to injury to see Elizabeth of York, the first daughter of Richard’s brother Edward, marry this wretch and live in what seemed like complicity with him, well it all left me very unhappy with the beginnings of the House of Tudor. But alas, history, it must be accepted, and I am always cheered when there is good in it.